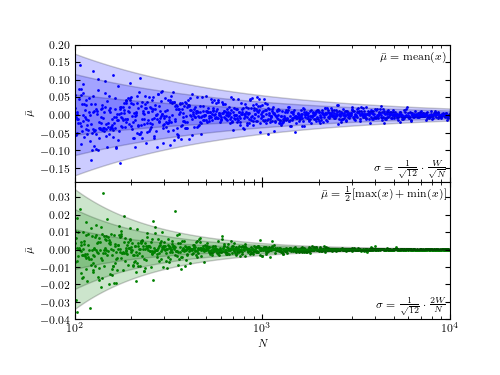 A comparison of the sample-size dependence of two estimators for the location parameter of a uniform distribution, with the sample size ranging from N = 100 to N =10,000. The estimator in the top panel is the sample mean, and the estimator in the bottom panel is the mean value of two extreme values. The theoretical 1-, 2-, and 3-sigma contours are shown for comparison. When using the sample mean to estimate the location parameter, the uncertainty decreases proportionally to 1/ N, and when using the mean of two extreme values as 1/N. Note different vertical scales for the two panels. , with an error that scales as . The shaded regions on the plot show the expected 1, 2, and 3- error. Notice the difference in scale between the y-axes of the two plots.